As a body shop owner, your biggest responsibility is ensuring your customers leave happy with the quality of work performed on their vehicle. Along with ensuring a high level of customer satisfaction, you also focus on growing your profit generation capabilities to succeed in the auto repair industry. Dent Wizard, the world leader in auto reconditioning can provide solutions to help streamline your body shop, improve quality control processes and help free up your existing technicians to perform larger, more profitable repairs. Body shop owners can realize these benefits and more by partnering with Dent Wizard and its highly-trained team of automotive reconditioning specialists. Dent Wizard has over 2,500 employees nationwide and we repair over 3 million vehicles per year. When Dent Wizard services are performed in your shop and customers leave satisfied, they’re happy with you and your body shop, and that keeps them coming back and referring other loyal customers. You have a busy repair shop and would rather focus your technician’s efforts on larger, high-dollar collision repairs paid for via insurance claims. We can help offset popular, yet relatively inexpensive service requests often on the same day. Why should a customer in need of a quick repair wait? That only hurts your reputation. Start your Dent Wizard body shop auto reconditioning program by calling 1-800-DENT-WIZ (1-800-336-8949). You can also submit a contact form; a local service representative will reach out within 24 hours. We have been pioneers in the PDR industry for over three decades. 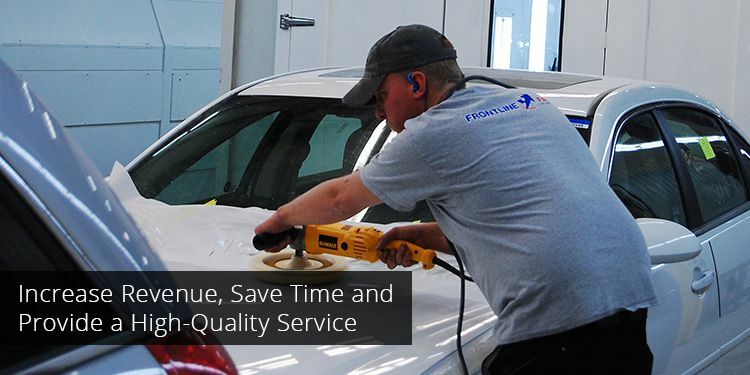 Save your body shop time and satisfy your customers with fast, affordable PDR repairs to restore panels, doors and more. Most body shops focus solely on the exterior of vehicles. Dent Wizard specializes in internal repair, growing your services and improving customer satisfaction by repairing consoles, dashboards, carpets, car seats, steering wheels and more. When hail hits, customers seek fast repairs, but you have a full lot of vehicles from before the storm already in your service queue. Our catastrophe response team is on standby to help you restore hail-damaged vehicles to pre-storm conditions. Work with Dent Wizard’s wheel repair specialists in your body shop. From repairing scratches, gouges and corrosion to bent wheels and peeling clear coats, Dent Wizard can help grow your wheel repair services or add another revenue stream. Scratches, chips, and scuffs drive car owners nuts. For your body shop, these lesser repairs are often a lower priority. Our specialists can drive increased customer satisfaction by handling these common requests. Keep customers coming back by offering Dent Wizard’s comprehensive vehicle protection plans that are designed to improve customer loyalty and are backed by a 100% satisfaction guarantee and limited lifetime warranty.